This Laundry Sorter with Hanging Bar separates your laundry into 3 separate loads. This cart is constructed of heavy duty chrome plated steel. It rolls smoothly on any surface with its lockable 2-inch wheels allowing you to move heavy laundry easily. Each of the three cotton canvas bags are equipped with removable duel chrome-wire handles. The bags are also supported by a wire grid tray system on the bottom shelf for added support. 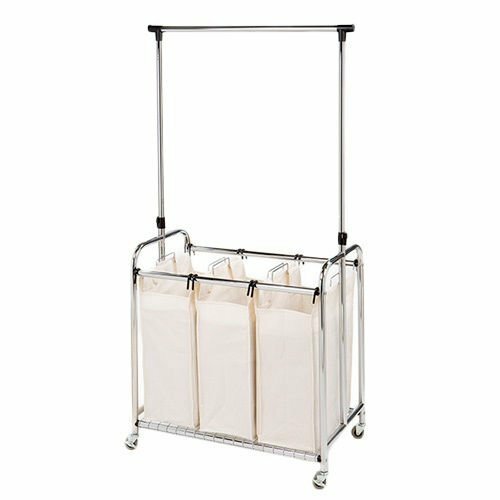 This laundry sorter also comes with an adjustable hanging bar for additional storage.